Vocokesh - "Self-Titled" / ST 37 - "Derobe"
F/i - "From Poppy With Love"/"Five Crowns Of The Saxon King"
Not exactly new releases but they showed up and are damned good so here you go. And its always cool when recordings get released on vinyl. An interesting concept is the shared album with Vocokesh taking one side and ST 37 taking the other. Vocokesh is a three piece band led by former F/i member Richard Franecki. This is heavily acid drenched guitar driven SpaceRock. "Forgotten Door At The End Of The Highway" features an Ash Ra Tempel-sounding exploratory guitar freakout accompanied by a tribal drum beat and acoustic guitar. "See The House" is pure power trio acid rock á la Bevis Frond. And "The 7th Crown" is an easy going, slightly metallic, psych jam. ST 37 plays the great stuff I was introduced to at Strange Daze '98. "Poppy Fields" is full of blazing guitars and odd percussive sounds accompanied by a single repeating piano line. Well-crafted weirdness makes this my favorite on the ST 37 side. "Surfin' With The Shah" and "Nicht Jetzt" both have danceable new-wavish rhythm sections accompanied by space madness. Surfin' is the better of the two with its driving drum beat and totally orbital guitars. I really like space bands that can get my toes tappin' while still playing exciting music. The F/i single is a solid two-song release. "From Poppy With Love" is classic guitar-driven, synth-laden F/i spacecore. 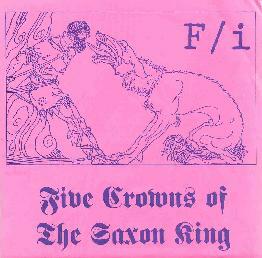 "Five Crowns Of The Saxon King" is a freakier Hawkwind-sounding piece with distorted vocals and droning synths. Somewhat symphonic but in a demented way. For information on these releases visit the RRRecords web site.